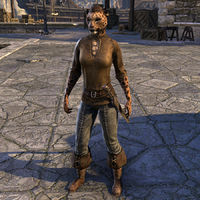 Farniri is a Khajiit laborer on the docks of Shimmerene in Summerset. You can find her wandering the northern part of the docks. "Farniri found gray fur on her pillow this morning. She hangs her head in shame." "A dockhand is only good as their strength. With growing age comes unemployment. But where else will Farniri go?" "With every crate moved, this one's bones ache more and more. Perhaps she grows too old for such work." This page was last modified on 2 July 2018, at 21:57.